Safely taking a shower can be challenging when you use a wheelchair. From slip-and-fall risks to logistical concerns surrounding getting in and out of the shower, this experience can be difficult when you do not have the right equipment. Fortunately, Walgreens offers a number of shower wheelchairs, easing the experience for wheelchair users. Shower wheelchairs make transport to and from the shower safe and simple, whether you have assistance or are showering without help. In fact, shower wheelchairs can give you added privacy, as they make showering without assistance an easier task. At the same time, these shower wheelchairs can also make using the restroom simple, as they slide over most standard-size toilets, never requiring you to get out of your wheelchair. 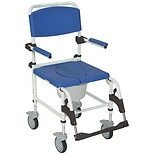 Even if you have a small bathroom, you'll find this compact wheelchair easy to maneuver, getting you in and out of the shower with ease. Shower wheelchairs available at Walgreens offer a number of other useful features as well. When you're seated in a shower wheelchair, you will have complete access to the body, making cleaning a breeze. Safety locks on the wheels ensure the wheelchair does not go anywhere you do not want it to go while you are showering. In addition, these wheelchairs are non-corrosive, being made of aluminum that will not rust, and so you do not have to worry about putting it in water. 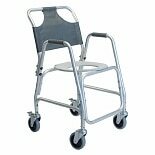 Rely on the wheelchairs' comfortable footrests to support your feet while you're moving yourself to and from the shower. 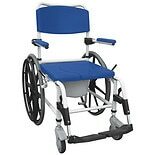 In addition, a comfortable backrest and cushioned armrests ensure that the shower wheelchair is as comfortable as it is functional. 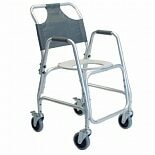 Finally, you will find these shower wheelchairs easy to clean, ensuring they always remain in excellent condition. Explore the shower wheelchairs available at Walgreens to decide which one is right for you. No matter your choice, you will be pleased with the product, as you're sure to find a shower wheelchair that is safe, easy to maneuver, comfortable, and compact enough for even the smallest bathrooms. Revolutionize your bathing experience today by adding a reliable shower wheelchair to your life. The convenience of this product will surprise you.